I've been seeing this image spreading around facebook and thought I'd google the quote to see when he said it/the context, and found nothing. Did he actually say this or has it been misattributed to him? It's impossible to prove a negative, but it's really hard to see how this isn't a misattribution. Google search offers only 4 unique links (7 including duplicates) searching for "Tony benn" + "establishment became established"; one of which is this question you asked. One is from a random blog (no citations/proof offered) from 2010: http://www.wordsonlife.co.uk/there-are-no-golden-rules/. One in a random comment on a forum thread from 2015 (I'll give you one guess on how well sourced that is). 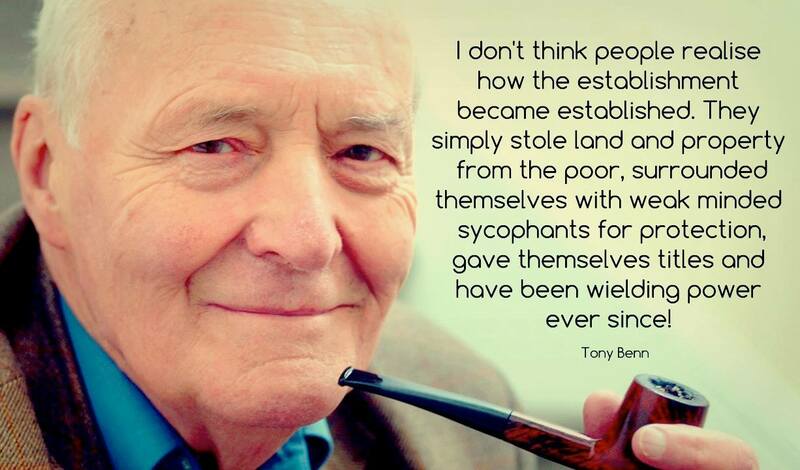 Tony Benn reportedly said: "I don't think people realise how the establishment became established. It simply stole the land and property off the poor, surrounded themselves with weak minded sycophants for protection, gave themselves titles and have been wielding power ever since." No attribution or cite, just reportedly said. And zero corroborating citations anywhere on Google search except for 2010 quotes page from a blog. Not the answer you're looking for? Browse other questions tagged quotes united-kingdom . Did the former prime minister of UK say this about the Koran?